A: One form of DVD discs that means a single-sided dual-layer DVD disc. DVD-9 can hold approximately 7.95 gigabytes of data. DVD-9 is used by most Hollywood movies as an anti-piracy scheme. Although most movie will have CSS copy protection code embedded in the video, the biggest hindrance to copying is the unavailability of DVD-R for DVD-9. CSS can be easily de-coded and cracked. Wanna burn your DVD9 movies to blank DVD9? Easy! Try Any DVD Cloner Platinum right now! Besides, Any DVD Cloner Platinum also allows you to shrink DVD9 to DVD5 and rip DVD9 to videos for playback on portable devices! 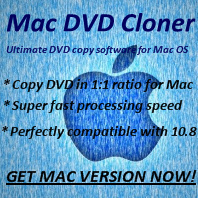 Download Any DVD Cloner Platinum Manual for details.